Direct Routing: If the weather is favorable, you may fly a heading from Prince Rupert Airport (CYPR) of 295 for 110 miles. Landing zone:2200 foot runway, lighted, and water. Water does not freeze in winter. ... in about 5 miles Trenham Point will be 3 miles off your right wing with Big Bay in the background behind the point. ... You are flying in the Oriflamme Passage. ... Off your left wing is Melville Island. ... in about 5 miles you should pass over "Green Light" a navigational marker. After this is the northern tip of Dundass Island and the small Holiday Island. You are entering Chatham Sound. ... Tree Point will come up ahead in about 12 miles. You will want to steer for the very tip of the point. Look closely has you pass it and you will see the Tree Point Lighthouse. ... As you approach Mary Island, watch carefully along the north shore for the Mary Island Lighthouse. 2. Over Mary Island, change your heading to 298 for 11 miles to cross over Bold Island. ... The large land mass to to the left is Annette Island, (PANT) is on the other side of the mountains from you at this point. ... The large inlet to your right side is the famous Behm Canal ... this circumnavigates the Revillagigedo Island upon which Ketchikan is situated. ... You are now flying over the Revillagigedo Channel and Bold Island should come into sight about 5 miles ahead. 3. Over Bold Island, change your heading to 276 for the south end of the Tongass Narrows and Pennock Island, 8 miles ahead. ... As you approach the mouth of the Tongass Narrows, Mountain Point will be on your right, and important VFR landmark. The inlet to your right is the Carroll Inlet, a 20 mile dead end but a beautiful inlet of water. ... The point to the left of the Tongass Narrows is Gravina Point, another VFR landmark for the area. You will see Pennock Island ahead in the center of the Tongass Narrows. 4. Over Pennock Island, correct your heading slightly to 295 to fly up the Tongass Narrows to Vallenar Point (the final point of land ahead to the left). 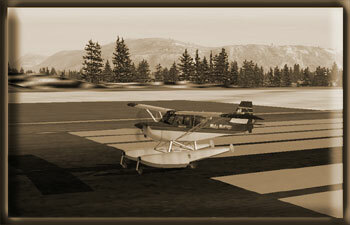 ... As you cross over Pennock Island, you will see (PAKT), Ketchikan Airport ahead to the left. On the right side of the aircraft you will see Ketchikan with the cruise ships usually docked there (except if the lakes are frozen). ...after you pass by the airport, you will see Ward Cove off your right wing, with the paper mill. ... The Totem Bight State Park will be after Ward Cove, and this is where Misty Moorings, Inc. has placed their operations Center called "Totem Bight." ...the furthest point of land to the left is Vallenar Point, fly over that point of land. 5. As you cross Vallenar Point, set a heading of 262 for 11 miles to Grindall Point. ...At this point, you are crossing over the "Inside Passage". ...You will be flying to the right of Grindall Point putting the shoreline of the peninsula to your left side. ... set your ADF for 321.000 for Misty's Place. 6. At Grindall Point, turn to a heading of 300 for 14 miles keeping the shorline to the left and following it up to Tolstoi Point. ... You will pass Lyman Point in about 4 miles to the left. ... the low mountain to port is Andrew Mountain. 7. At Tolstoi Point, you will see a large bay around the point to your left. Round the point and head toward Thorne Bay coming to a heading of 240. ... Misty's Place is in Thorne Bay directly ahead about 4 miles. You will see several islands in the mouth of Thorne Bay, fly over those islands. ... You will be coming at Misty's Place almost perpendicular (90 degrees) to the runway. Either prepare to make a right turn up Thorne Bay for a right base, or fly over the marine marker in the bay and make a very sharp turn to the right to make the runway.